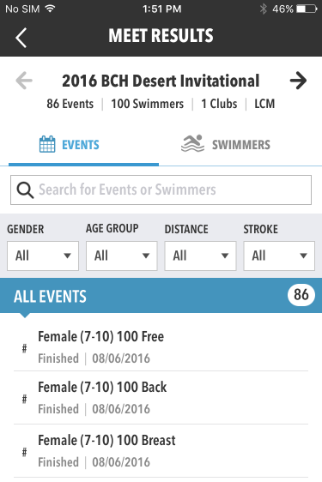 View meet results from any past meet, all in the palm of your hand. 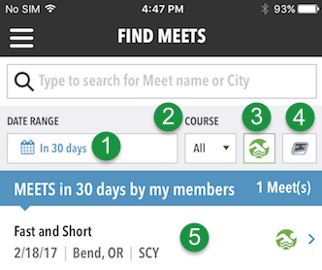 Access under > Events > Meet Results. DATE RANGE — Default range is 30 days. Tap to change. COURSE — Defaults to all course types. Tap to narrow down to a specific course—SCY, SCM or LCM. 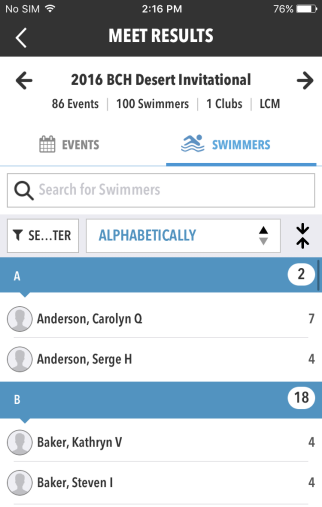 MY SWIMMER — Tap to toggle showing only events which include your swimmers or all events. TOUCHPAD — Defaults to TouchPad and non-TouchPad results. Tap to toggle to show only results from TouchPad. Tap a meet results title to view. Arrows at top navigate among results from different meets. 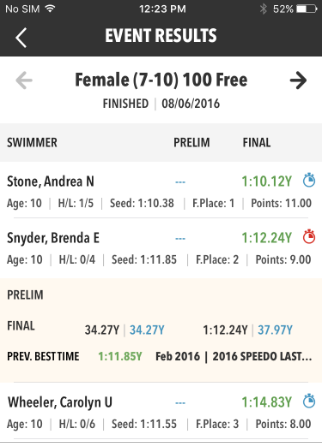 Use filters to narrow down results by GENDER, AGE GROUP, DISTANCE, and STROKE. 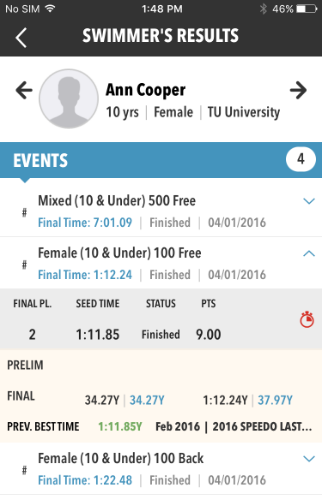 Tap an event to see results for all swimmers in that event. Arrows at top navigate among events. Tap stopwatch to view splits. Number to right of athlete’s name indicates number of times in this meet. Tap an athlete’s name to see all their results for this meet. Arrows at top navigate among athletes. Tap the down arrow to the right to view details, then stopwatch to view splits. Job Manager is up next.